Skiing appeared in the Alps at the end of the 19th century when a captain of the army returned from Oslo Norway with telemark skis. At the end of the second world war, with the development of the ski resorts, a rear binding was developed and the alpine technique was born. 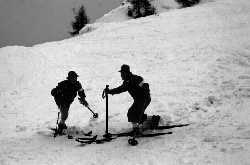 Then, towards the end of eighties, Telemark skiing which never lost its followers in the Scandinavian countries, began to reappear on the slopes of our resorts. This elegance in movement, like that a dancer, sparked the curiosity of local skiers to test this "new" old technique. With the intermediate level of an alpine skier, one can experience the exceptional sensation of telemark skiing. Those who have tried could have never imagined that after only a few hours of lessons, they could telemark their favorite slopes. If you dare, you will discover the magical movements of the telemark turns, in the bumps and of course, off piste telemaking ! so we can share with you our passion of the most beautiful skiing we know of the Alps. With friends, come and try a new adventure which will remain unforgettable. We will help you discover your skill level and aptitude as a telemarker. The instructor will adapt his teaching technique to your own personal needs. He will correct your weaknesses and focus on your strengths. to allow you to relax and enjoy the smooth motions of telemark skiing. Have a look to our Special Offers ! ARVA, backpack with shovel, probe, first aid kit and contact radio. 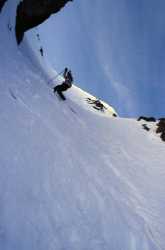 Off-piste training course are limited to 6 participants. Consult our off piste page ! Group lessons are limited to a maximum of 6 clients. "Group lessons can be arranged by advance reservation only. A maximum of 6 clients will be with each professional. To run a 6 day course there must be at 3 clients. However, if only 2 clients sign up, we will offer you 4 days instead of 6. And if only 1 client sign up, we will offer you a 2 days course. In the case of 1 or 2 clients, it is cheaper to sign up for the above mentioned options than to enroll in a private lesson."